They have everything bishops have and more, except their res cool down is twice as long. I'm scared what this class is going to do to bishops. However, still maining this once it's out! MW is seriously adorable. I'm in love with this class. I think Nexon is seriously trying to woo players with this. The images in your post exceed 2 MB and will not be permitted due to excessive bandwidth demand and page load delays. Please go back and remove some, or use smaller/compressed versions and link to the higher quality ones externally. A lot of people gave the bear's form a hard time, but I personally love it. I think this class is looking amazing so far. They've definitely beyond woo'd me. I already prepared mage equips since the first information was released on them... and I've never played a mage class before. Now I'm even more excited! Do as our extractors do, and post links to the animations. I suggest linking them like Locked does in his extraction posts. it's also easier on anyone trying to load the page. You best multi-post, or ask one of the mods/Eos/Fiel to do something for you. edit: ok no that's a bad idea. Links are best for us yeah. Last edited by hadriel; 2014-01-05 at 08:58 AM. Reason: lol trinja-ed. Hopefully it'll come out in GMS soon! If you have access to the data, not sure if doing an SS or copy-paste dump will serve us well... you could try but probably variables will be all over the place. Is that Bright Eyes by default on the male? Not bad! Loving the customization, and I love the look of their weapon. The forest theme is great as well. Thanks for doing all this, so I hate to ask for more, but is it possible to extract the weapon data for BT's new weapon type? I'm really curious about them. Doesn't matter if you can't though. Also, something small, but does she have a Secondary Equip? Originally Posted by Translated version. For variables data see previous post. Every time Spirit Tamer receives experience, its own experience will increase and automatically level. Every time Spirit Tamer levels, for 30 minutes, Elf's Self-Cultivation growth rate will increase by 200%. Basically it refers to the EXP gain from the skill being increased by 200% (i.e. you get 300% EXP gain rate, up from 100%) both when Spirit Tamer levels and when the skill levels (and they stack, but doesn't mention how it stacks i.e. additive or multiplicative). There is no mention of how long the latter effect persists. Data dumped has no mention of variables corresponding to EXP gain rate, so it might be a server-sided thing. Here's the world map of the new region in Dawnveil, Arbren. It looks amazing! This type of theme is one of my favorites. I'm getting +200% buff duration and make myself an immortal Beast Tamer. I thought Buff Duration doesn't apply to hyper skills? Also, hype. It cometh strong on this one. 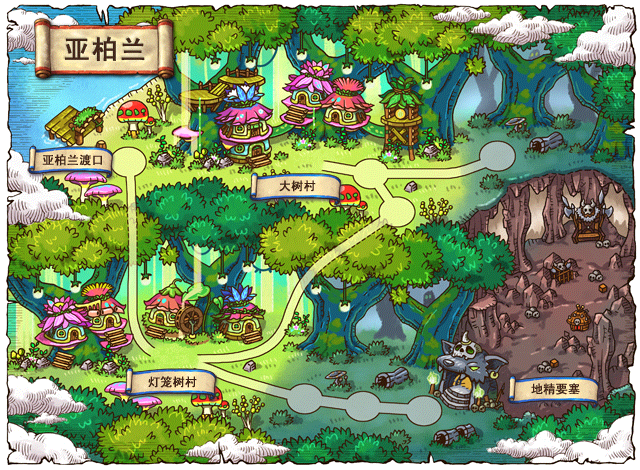 Going clockwise from bottom left: Lanturn Tree Village, Arbren Port, Big Tree Village, Earth Spirit Camp. Doesn't take a genius to know who's the bad guy and who's the good guy. edit: also @Spadow; no level 200 Hyper skill? But I have 35% buff duration or so on my Paladin and my invincibility surely lasts longer than 30 sec. So maybe it does apply? Or am I just lagging really badly? Whatever the case, 90 sec cooldown for that skill is quite OP. The Paladin equivalent of that skill has a 300 sec cooldown and no damage buff. And now that I look at the other skills they all seem ridiculously OP.